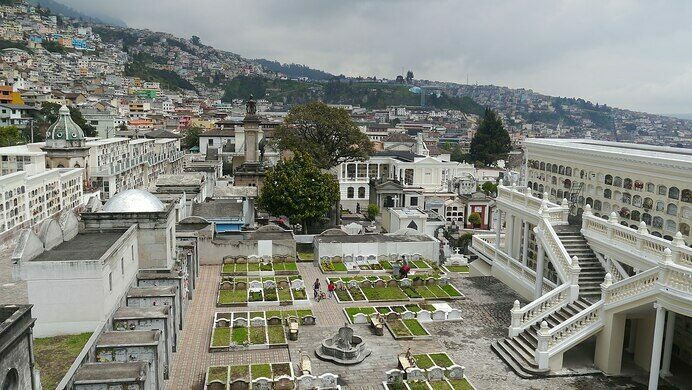 One of the most historic cemeteries in Quito is an eclectic mix of architectural styles and famous tombs. 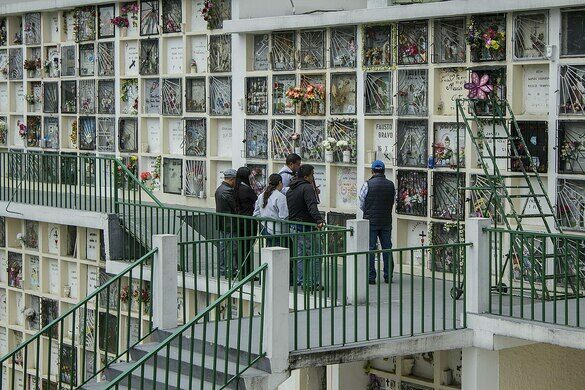 The Cementerio de San Diego is the final resting place for many famous figures from Ecuador’s past, including presidents, poets and military leaders. It’s also an eclectic mix of funerary architecture and traditions, which have slowly changed over the past 150 years. An abandoned Ecuadorian prison that once held ex-presidents and notorious con artists is frozen in time as a museum. The Cementerio de San Diego opened to the public in 1872, on land that had already seen its share of burials. Fifty years previously, fallen soldiers from the Battle of Pichincha – a turning point in Ecuador’s war of independence – had been buried here, the final resting place for some of the 600 men who died on both sides. Since its inauguration, the cemetery has become one of the most emblematic and historic burial grounds in the city. Among the famous names buried here are former presidents of the republic, including Gonzalo Córdova, Aurelio Mosquera and José María Velasco Ibarra, and the poet Jorge Carrera Andrade. The cemetery is also famous for its funerary architecture. Over the years, families of note have commissioned noteworthy architects to design their tombs. 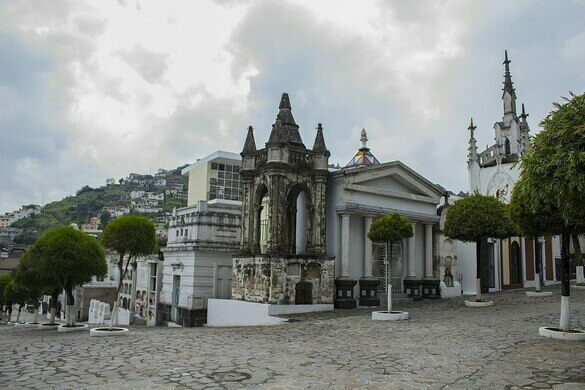 There are mausoleums by acclaimed Quito architects such as Pietro Capurro, Luis Mideros and Francisco Durini, built in various styles, including neoclassical, neo-gothic, baroque, neo-baroque and more. Sarcophagi and gravestones are also decorated in a wide range of styles, from neo-Byzantine to Art Nouveau and Art Deco. A stroll through the Cementerio de San Diego will also take you through various sections that display different burial traditions. Along with the stand-alone tombs of the wealthy are rows of niche walls in which more common folk are interred. There’s also a large, open space for small gravestones, all neatly arranged in rows, some parts of which are set aside for child burials. And in the midst of these gravestones stands the San Diego Chapel, built in 1935 by the German architect Father Pedro Brunning. The cemetery is very much a community space, and the houses of local residents look down upon the cemetery from the surrounding hillsides. And, like much of Quito, the cemetery lies under the watchful eye of the Virgen de El Panecillo, a winged statue of the Virgin Mary that stands on a nearby hill. The Cementerio de San Diego is located in the San Roque neighborhood, less than a mile to the southwest of the Plaza Grande in the city center. It is open every day from 8 a.m. to 5 p.m. Entrance is free.